We’d love your help. 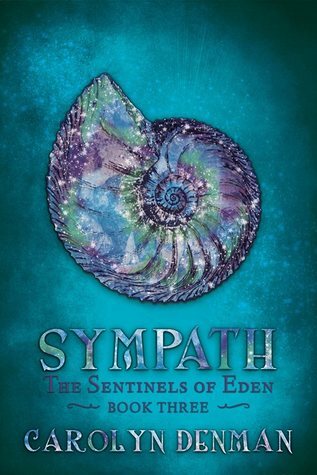 Let us know what’s wrong with this preview of Sympath by Carolyn Denman. Annie has grown up knowing she is destined to meet her soul mate. He will always remain close to her. He will always know exactly where she is, and how she’s feeling. He’ll guard and protect her. At least, until she produces the next heir to her Cherubim line. There has to be a way to avoid this supernatural stalker. Determined to find her own identity before becoming bonde Annie has grown up knowing she is destined to meet her soul mate. He will always remain close to her. He will always know exactly where she is, and how she’s feeling. He’ll guard and protect her. At least, until she produces the next heir to her Cherubim line. To ask other readers questions about Sympath, please sign up. Denman again delivers a sweet and sorrowful tail of nearly but not quite. This wonderfully told story is set in the nineties where the story revolves around Annie and Harry rather than Lanie and Noah. I'm not going to spoil it except to say there is love, pain, near death, trickery and sorrow and that is just in the first chapter. A very enjoyable read. I can't wait to see how this story weaves into the next. This book was utterly gripping and emotionally compelling from the first page. Very hard to put down. I can't wait for book 4! I haven't read the first two in the series, but I certainly will seek them now, and wait (im)patiently for number four. Sympath is set in 1980s Australia - a 1980s Australia that is not only recognisable, but almost tangible - with the sights, sounds, perspectives and limitations of the era. However the story features paranormal characters whose values and vision lift the narrative to a much higher plane. I very much enjoyed the folk in this book. I'm a little bit in love with Harry (how not? ), and more than a bit dazzled by Lucas (again, how not? ), but it's Annie whose strength and resilience captures me most. The necessity of keeping Eden safe and secret imposes many trials on the Cherubim and their human Guardians, and all of this is rendered with a sure and deft touch. A completely credible para-world emerges, one that we can almost glimpse in our own surroundings. So real. The book revolves around spirituality and philosophy, enough to make the reader consider her own values and attitudes, but not intrusively. Fundamentally the story is about the choices we make and how these affect the world/s in which we live. Sympath includes a crime mystery that rivals any of the Peter Temple stories, and a rural setting that's just as brilliantly described as anything in Raimond Gaita or Sally Morgan's works. I think this might be my favourite book of the series so far. It goes back to when Lainie’s mother was a teen and trying to avoid being bonded to her Guardian until she was ready for it. Of course, nothing goes as planned and it was wonderful to see the relationship developing between Annie and Lucas despite her doing everything she could to derail fate’s plan for her. It was also great to see a young Harry and watch him overcome personal tragedy and adversity to mature into the man Lainie looke I think this might be my favourite book of the series so far. It goes back to when Lainie’s mother was a teen and trying to avoid being bonded to her Guardian until she was ready for it. Of course, nothing goes as planned and it was wonderful to see the relationship developing between Annie and Lucas despite her doing everything she could to derail fate’s plan for her. It was also great to see a young Harry and watch him overcome personal tragedy and adversity to mature into the man Lainie looked to for guidance in book one. With the fore warning of what would happen in the future from the first two books, it was bittersweet to watch Annie and Lucas fall in love. Even though I know how their particular story ends, it still made for an engrossing read, as was Harry’s realisation of who his Guardian was and what the future would hold for them. With a murder mystery and a crime syndicate thrown into the mix, it made for a tense and exciting story that kept me glued to the pages. Having first met Annie as the absentee parent in book one, seeing how she had come to be that way gave great insight into her character and I loved that she went form strength to strength in this story as she learned what it truly meant to be Cherubim and exactly what the bond with her Guardian signified. I especially loved the end and can’t wait to see what will happen next for Annie as she reconnects with Lainie and the world beyond Eden. As a result, I will be waiting impatiently to read the next book in the series. Just like the previous novels in this series, I was unable to put the book down. This is basically a prequel to book 1 and 2 sharing the story of Lainie's parents, Annie and Lucas. Once again, the storyline has plenty of intrigue, action, and romance. The writing is always effortless, making this series accessible to anyone. I cannot wait for the last book. From the epilogue, it seems that Annie's and Lainie's storylines will tie in together in what I expect to be an epic series finale.